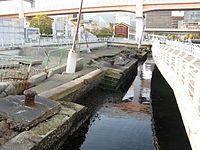 ^ The City of Kobe (January 1, 2009). "STATISTICS" (PDF). 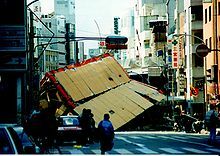 The Great Hanshin-Awaji Earthquake: Statistics and Restoration Progress. Archived from the original (PDF) on June 26, 2011. Retrieved 2009-11-29. ^ Kobe City FIRE Bureau (January 17, 2006). "被害の状況". 阪神・淡路大震災. Kobe City Fire Bureau. Archived from the original on April 14, 2008. Retrieved 2008-05-25. ^ "Earthquakes in Japan" (PDF) (in Japanese). Cabinet Office, Government of Japan. pp. 5–6. Retrieved 2009-05-06. ^ Somerville, Paul (February 7, 1995). 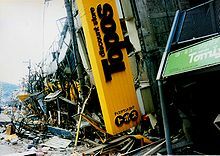 "Kobe Earthquake: An Urban Disaster". Eos. 76 (6): 49. Bibcode:1995EOSTr..76...49S. doi:10.1029/EO076i006p00049-02 (inactive 2019-03-13). Archived from the original on May 1, 1997. Retrieved 2009-05-06. ^ "'Disaster Prevention and Volunteerism Day' and 'Disaster Prevention and Volunteerism Week'" (in Japanese). Cabinet Office, Government of Japan. December 15, 1995. Retrieved 2009-05-02. ^ Burritt Sabin (October 31, 2004). 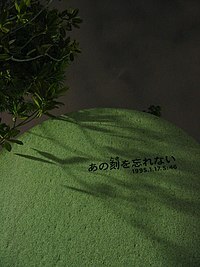 "The Great Hanshin Earthquake: Lessons for Niigata". J@pan Inc Newsletter (No. 295). Japan Inc Communications. Retrieved 2008-05-25. ^ "Restoration from the earthquake disaster – City planning based on the lessons learned from the disaster". 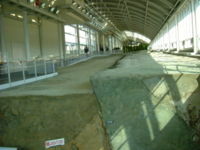 Great Hanshin Earthquake Restoration. Kinki Regional Development Bureau, Ministry of Land, Infrastructure and Transport]. Retrieved 2006-11-23. 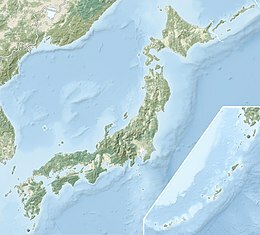 Kitamura, R.; Yamamoto, T.; Fujii, S. (1998). "Impacts of the Hanshin-Awaji Earthquake on Traffic and Travel – Where Did All the Traffic Go?". In Cairns, S.; Hass-Klau, C.; Goodwin, P. Traffic Impact of Highway Capacity Reductions: Assessment of the Evidence. London: Landor Publishing. pp. 239–261.